IF YOU WERE ONE OF MANY HOME OWNERS WHO SPENT THIS LAST WINTER ENDURING PERPETUALLY LEAKING ROOFS, DRIPPING GUTTERS AND RESULTANT SLEEPLESS NIGHTS, NOW’S THE TIME TO TAKE ACTION. Operating extensively within the residential roofing market since 1931, Scheltema offers to assess the condition of the roof and supply a quotation, if required. The company also advises as to the type of new roof coverage required – whether clay, cement, slate tile or steel sheeting – as well as the capacity of the existing roof structure to accommodate the load. Re-roofing is not only technically challenging, it is also subject to extensive regulations, particularly with regard to asbestos removal, insulation and materials. Scheltema is a certified asbestos removal contractor and therefore qualified to remove and correctly dispose of asbestos slate and Big Six Profile roof-sheets. The company also guarantees its work for a minimum two-year period, and all products used have the necessary warranties in place and are environmentally sustainable. 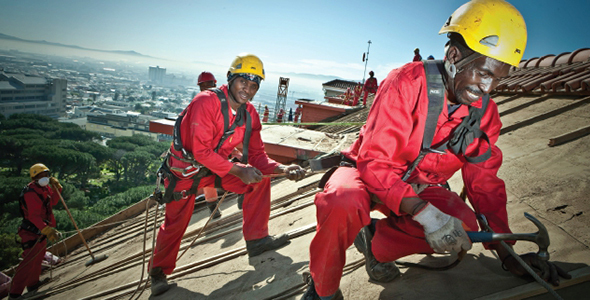 Re-roofing involves working at heights and can therefore be dangerous. What many residents are unaware of, is that when undertaking renovations, they are untimely responsible for the safety of the workers on site, and that unless the building contractor has the correct workman’s compensation insurances in place, the home owner may be liable for costs and claims, should anyone be injured during the roofing or construction process. Scheltema is governed by the rules and regulations as stipulated by the Building and Industrial Bargaining Council (BIBC) with respect to minimum wages, pension schemes, holiday pay and staff training. Their affiliation with FEM means that all Scheltema employees are registered for workman’s compensation. Furthermore, Scheltema’s longstanding MBA membership provides the homeowner with an additional measure of assurance to quality and standards of excellence.